The Johnstown Tomahawks will play the Port Huron Fighting Falcons tonight and Saturday night with a new face in the Tomahawks' lineup. Eric Hewitt was called up from the MNJHL and should be in the lineup this weekend. Hewitt, the Saginaw, MI native stands at 5'10, 170 lb, and is a 1996 birth year player. 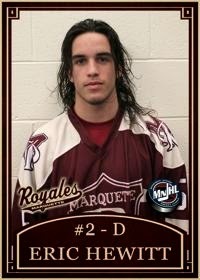 This season Hewitt has played in 35 games for the Marquette Royals of the MNJHL. In those 35 games he has 19 points (6 goals, 13 assists) and 78 penalty minutes. Assistant coach for the Royals, Cliff Cook wrote a story about the signing that you can read here. In the press release Hewitt says, "Johnstown was the only NAHL team I wanted to play for, and I want to thank the coaches and the entire Tomahawks organization for this opportunity. Before joining the Royals this season, Hewitt was the 2012-2013 Player of the Year in the WSHL. Playing for the New Mexico Renegades, he appeared in 45 games recording 17 points (3 goals, 14 assists) and 61 penalty minutes. As it stands right now, like several of the other players recently called up to Johnstown, this is a player getting a chance to show off what he can bring to the team as the team tries to get healthy, and could lead to getting a full time spot next year. Just last weekend that was the case with Jake Houston. Johnstown and Port Huron faceoff tonight at 7pm. Labels: Eric Hewitt, Johnstown Tomahawks, NAHL.